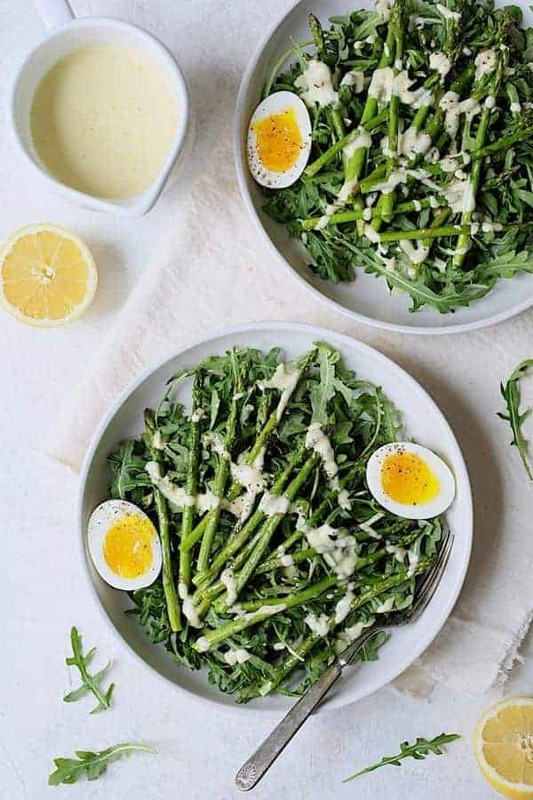 Arugula, Egg and Asparagus Salad with Creamy Lemon Vinaigrette is the perfect way to kick off spring! Peppery arugula, roasted asparagus, soft-boiled eggs and a lively lemon vinaigrette make the perfect side dish salad for a spring evening. It’s also Progressive Eats time, I’m the host and our theme this month is “A Spring Eggstravaganza!” Scroll on down for links to more amazing egg recipes from some of my food blogger friends! What’s more spring-inspired than eggs? No Easter or Passover is complete without them. 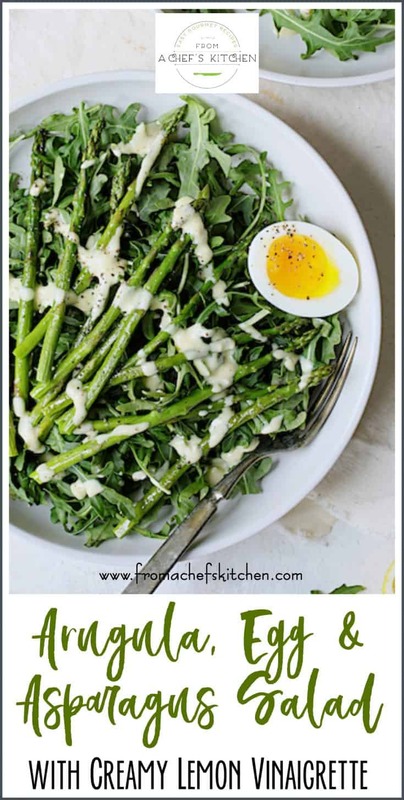 Arugula, Egg and Asparagus Salad with Creamy Lemon Vinaigrette is the perfect side dish salad or if you add another egg, a hearty main course salad. Pair it with a smooth and creamy tomato or carrot soup and you’ve got dinner! But first, we need to cook some eggs! Anyone who has ever eaten an egg knows there are numerous ways to cook one. If you’re ordering them in a diner, there are a dozen or so ways you could request them. However, did you know the 100 folds in a chef’s hat represent all the number of ways a chef knows how to cook an egg? Cooking the eggs for this Arugula, Egg and Asparagus Salad with Creamy Lemon Vinaigrette recipe was a real learning experience for me because I had never done a “soft-boiled” egg before. I’ve done tons of hard-boiled eggs for deviled eggs and for a tuna salad that is a client favorite. When it comes to making hard-boiled eggs easy to peel, you’ll find lots of information, tips and old wives tales. Some recommend not using fresh eggs. Um. Bleh. Who wants less-than-fresh eggs? Some recommend salt, vinegar or baking soda in the water. How does the egg know what’s in the water? Peeling eggs used to drive me and my mother-in-law crazy until we discovered this trick from Bon Appetit: If you want eggs that will peel perfectly, you need to start with eggs that are good and cold out of the refrigerator. Carefully place them into boiling water. When that membrane between the egg white and the shell hits the boiling water, it will immediately separate from the white and adhere to the shell. Then, shock in ice water. Ta-Daaa! Life-changing egg moment! When testing for this recipe, I dropped them into boiling water and cooked one for 8 minutes, another for 4 minutes, then yet a third for 6 minutes and 30 seconds. The third produced this lovely result! The yolk was “set” around the edges but the interior was still soft, creamy and runny. Yolk perfection! Now, not everyone likes a runny yolk so if you boil them for 10-12 minutes, you’ll have a well-set yolk. Keep in mind that a runny yolk is not appropriate for children, the elderly or anyone else with a less-than-active immune system. 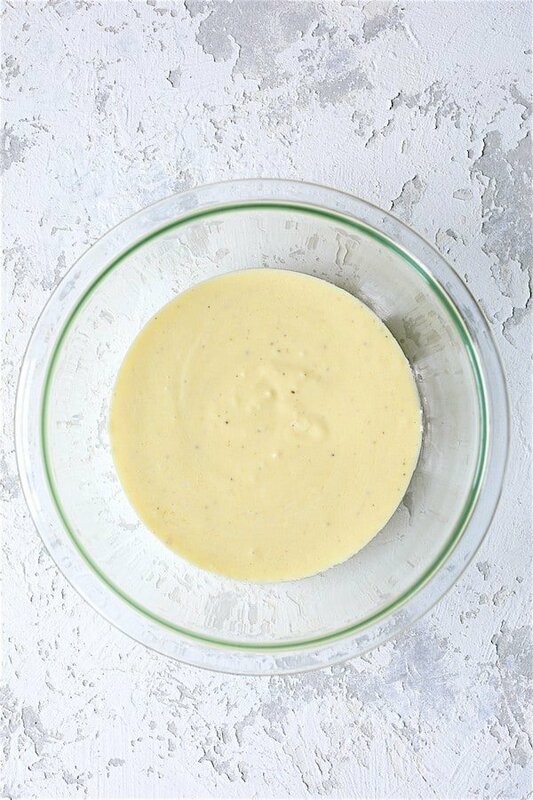 Mix up the creamy lemon vinaigrette that starts with the goodness of Greek yogurt…. 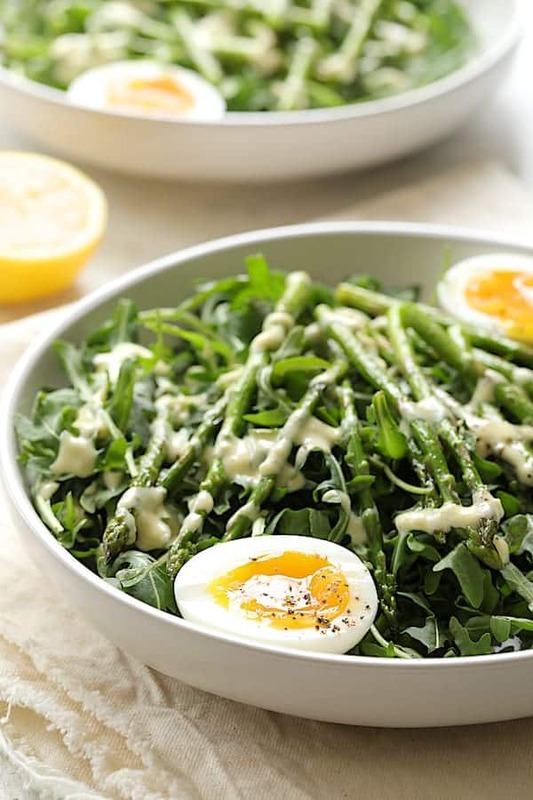 Place arugula on a plate, top with the asparagus and eggs and drizzle with the creamy lemon vinaigrette! So delicious! So springy! And with that… let’s get to the rest of our Progressive Eats menu! Welcome to Progressive Eats, our virtual version of a Progressive Dinner Party. Each recipe in our menu this month features eggs! If you’re unfamiliar with the concept, a progressive dinner involves going from house to house, enjoying a different course at each location. 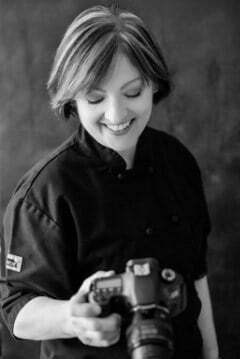 With Progressive Eats itís a virtual party. A theme is chosen each month, members share recipes suitable for a delicious meal or party, and you can hop from blog to blog to check them out. Come along and see all of these delicious dishes that feature eggs! 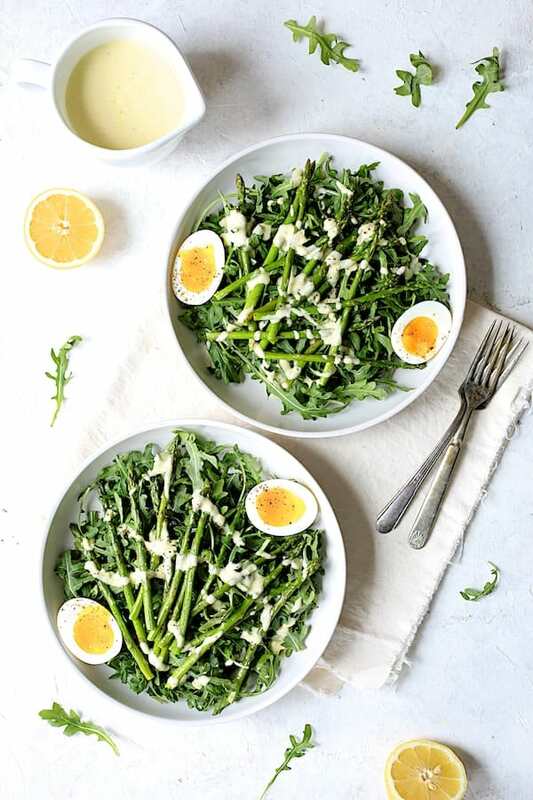 Arugula, Egg and Asparagus Salad with Creamy Lemon Vinaigrette is the perfect way to kick off spring! Peppery arugula, roasted asparagus, soft-boiled eggs and a lively lemon vinaigrette make the perfect side dish salad for a spring evening. Preheat oven to 400 degrees. Prepare an ice bath. Bring a small saucepan full of water to a boil. Carefully add the eggs. Cook 6 minutes and 30 seconds or to desired doneness. Transfer to the bowl of ice water. Let stand for 2-3 minutes. Peel and cut in half. 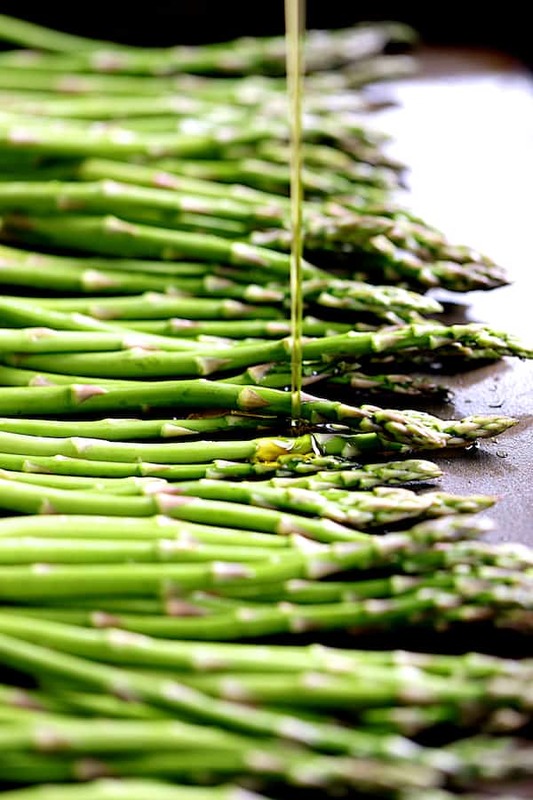 Place asparagus on a baking sheet and drizzle with olive oil and season to taste with salt and black pepper. Roast for 5-6 minutes. TO SERVE: Place arugula on a salad plate. Top with a fourth of the roasted asparagus. Drizzle with some of the vinaigrette. Add two egg halves per plate and serve immediately. If you're organized, boiling the eggs, roasting the asparagus and whisking the vinaigrette together can all be done in approximately the same amount of time. I frequently feel like peeling eggs is a Zen meditation. Or it could be, if I didn’t get so annoyed when the shell peels off one tiny piece at a time. I’m totally trying your method. And trying this delicious, simple salad too. It’s right up my alley, and I’m craving asparagus these days! Thanks so much for hosting us this week!!! Thank you, Susan! You’re right about the peeling eggs thing! Hope you enjoy! Thanks, Beth! A preserved lemon sounds amazing! This salad is so pretty! And all those spring flavors! I make hard-boiled eggs a little differently, but the cold water shock at the end is a MUST for me too. Thanks, Sarah! 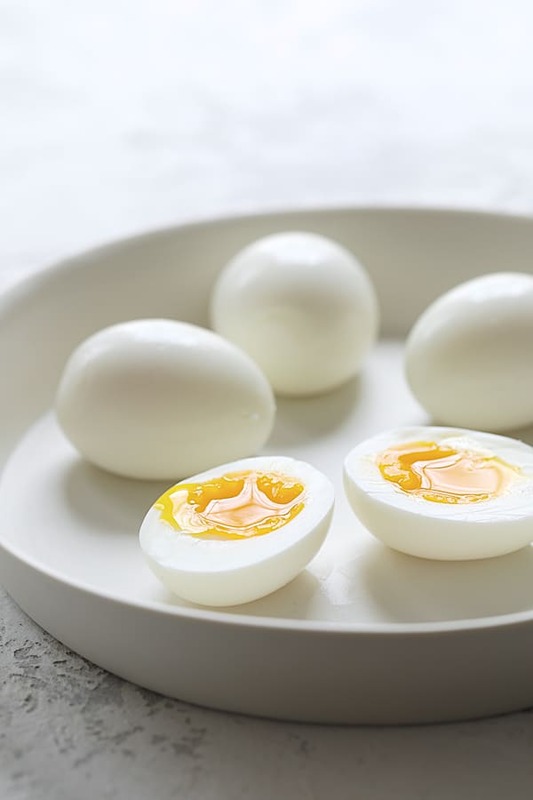 There definitely are many different ways to make hard-boiled eggs. If you’ve got a method that works for you then you may not want to change it! Like you, I have had a devil of a time finding a way to cook and peel eggs that satisfies me. 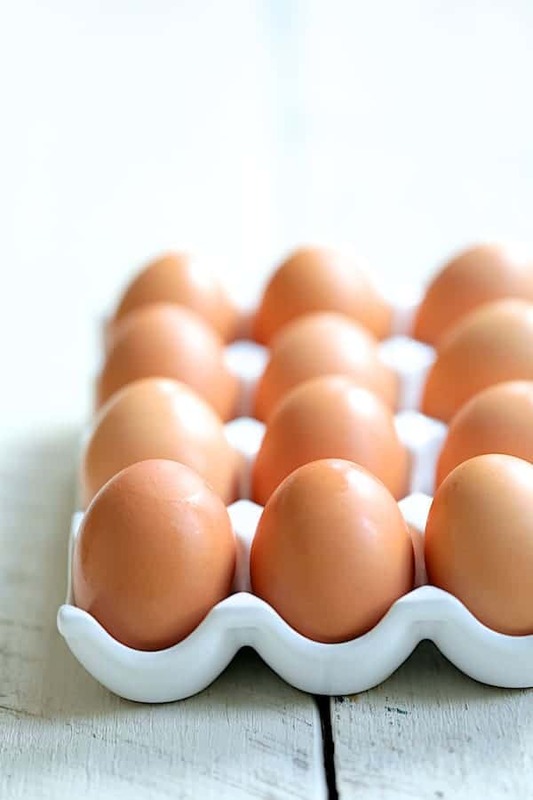 Although I’m currently enamored of a different method from yours – I steam them, then shock the eggs in ice cold water, let them sit there for a few minutes, then peel, I am fine with any method that works. And I’m awed by the beauty of your finished result, and the salad they surround. They are almost too gorgeous to eat – but not quite. I can’t wait to try this dish. Thank you, Laura! Now, steaming I haven’t tried. Ever since we got the method to work where we place cold eggs into boiling water, then shocking them, I haven’t ventured further. Thanks again! Such a gorgeous salad and the perfect way to celebrate spring produce showing up at the farmer’s market! Wow that salad is gorgeous! Thanks for the great theme. I’m definitely going to have to try your egg boiling method! Hi, Tamara, They really can be frustrating, but that method works like a charm! Hope you enjoy! I LOVE spring asparagus, this is a beautiful dish and so simple. I’ve got something similar in the works and I know that I’ll have nothing but asparagus, egg, and prosciutto for dinner that day, nothing else! Thanks so much, Barb! Prosciutto would be a great addition to this salad! Thanks, Ansh! Yes, that’s how we always did it, too and always ran into problems. The shell slips right off doing it this way.